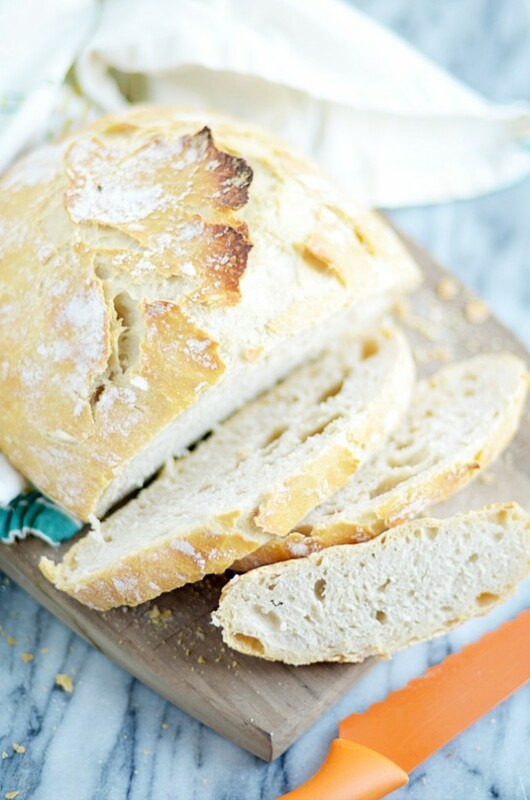 Ridiculously easy bread that is super crusty on the outside and steamy soft on the inside. 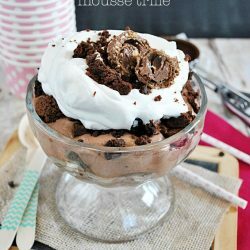 You won’t believe how fool-proof this recipe is! 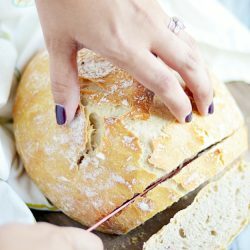 I have been OBSESSED with making homemade bread recently. Which is a little weird (and HOT!) 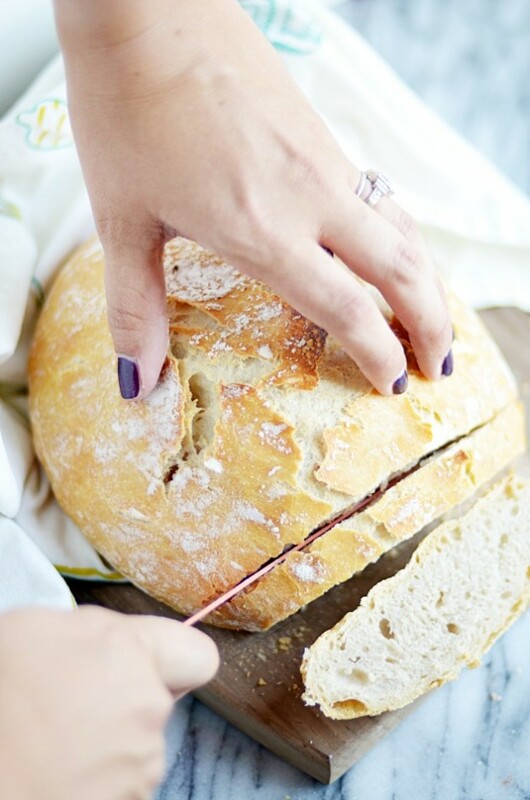 for summertime, I know… but is homemade bread ever really out of season?? I actually have two different recipes I want to share with you, but for today– this Overnight Artisan Bread is what I’ve been making most frequently. And it’s been worth turning on the hot oven in the middle of June, I promise! Aside from the crusty outside and heavenly soft insides, there’s something else I really, really like about this bread. It is SO EASY to make. And I mean, SOOOOOOOOOOO easy. You don’t need a mixer at all, in fact, you don’t even have to knead the dough! Just stir it with a spoon, and then cover it up to do it’s thing overnight. That’s the other thing I love about this recipe. With most yeast breads, you have to be realllllly careful of the rising time. You always have to make sure that it rises just right— not too much or it will fall, and not too little or it won’t be soft and puffy. Which means, you usually have to be around to babysit the dough for an hour or two. But not this bread! Mix up the dough (and let’s review here– no mixer and no kneading! ), and then let it just sit on the counter overnight. It can rest at room temp for 12-18 hours!! That’s a whole lot of time that you DON’T need to babysit dough. I seriously adore low maintenance recipes like this one. After the 12-18 hours of rising, the dough will be puffed up in the bowl. Don’t worry, it shouldn’t look smooth and round like typical bread dough. It will be sticky and pocked, and it should be pretty much level and flat. 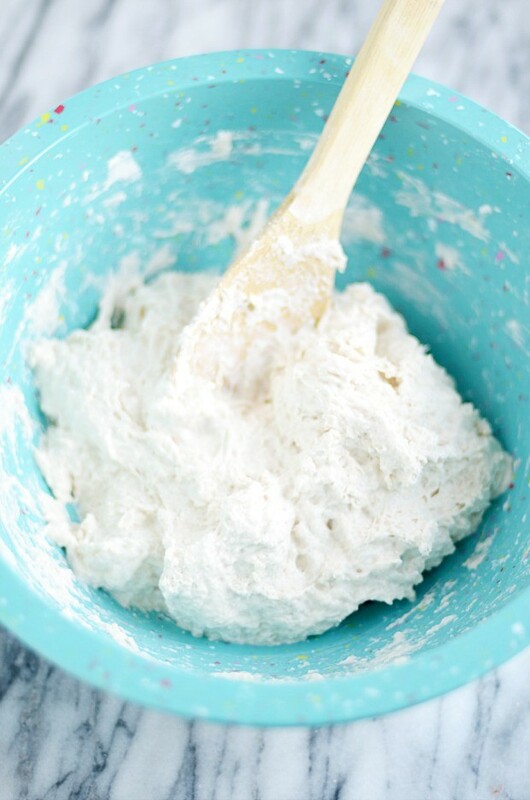 Use floured hands to grab the dough out of the bowl and gently form into a round disc. Loosely wrap the dough in plastic or a bread towel while the oven is preheating. Once the oven and the pot have preheated, place the dough in the pot, cover, and start baking! 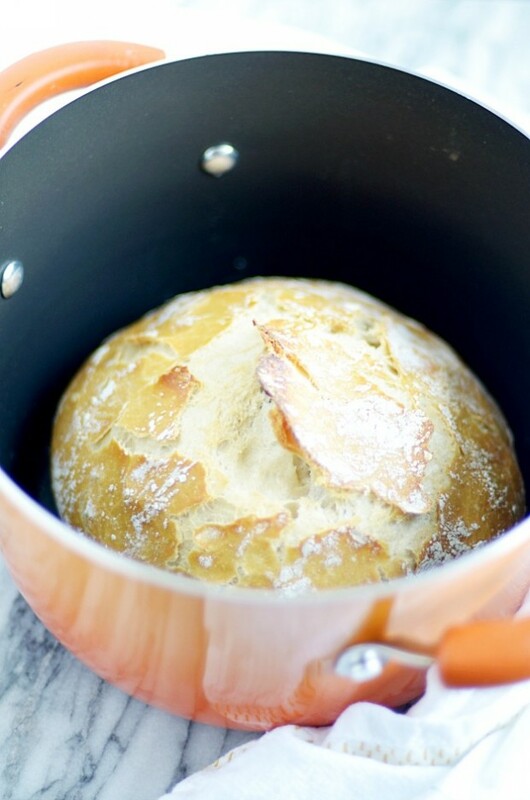 Baking the bread in a dutch oven (or any covered pot that is oven safe up to 450ºF) is what makes this bread taste so special! The steam from baking in a covered pot bakes the inside of the bread to soft perfection, and it’s also responsible for making an incredible crust on the outside. Steam is like the secret weapon of bread-making. It does magical things. ???? Once the bread cools (if you can wait that long before digging in), slice it up and serve it with pretty much anything! It makes fabulous sandwiches, incredible french toast, and even makes for a classy dinner bread on the side. 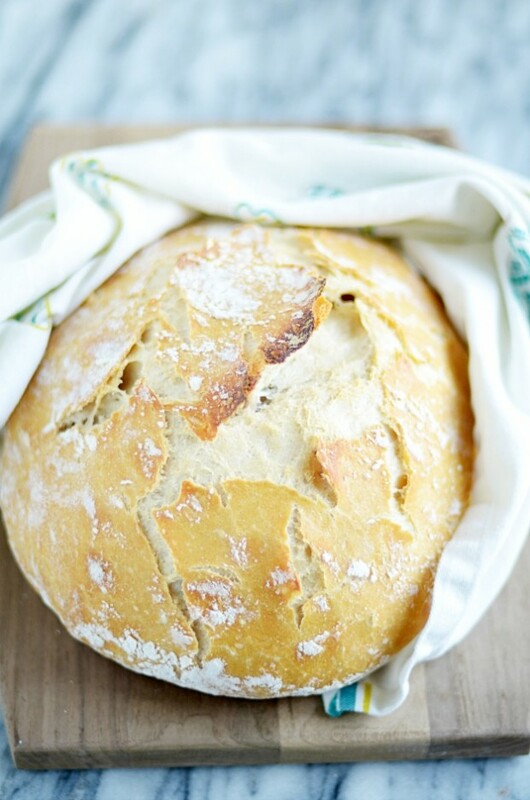 Ridiculously easy bread that is super crusty on the outside and steamy soft on the inside. You won't believe how fool-proof this recipe is! In a large bowl, mix together all of the ingredients by hand until a sticky dough forms. Cover with a cloth and let rest overnight (12-18 hours) at room temperature. Using well floured hands, turn dough out on to a floured surface and shape into a disc. Wrap loosely in plastic wrap or a cloth (preferable), and set aside while preheating the oven. Preheat the oven, to 450ºF. Place dutch oven or pot in the preheated oven for 30 minutes. Remove pot and carefully place dough inside. Cover and bake for 30 minutes. Let cool on a cutting board after baking time is over. Sweet Treats and Swanky Stuff Saturday & a Belated Birthday Bash!